Any cross section through the mid neck has 4 arteries that supply the brain. 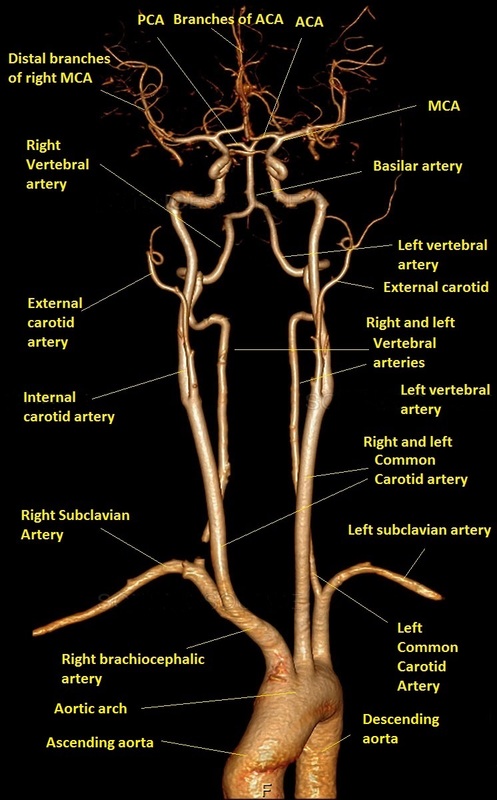 These are the right and left internal carotid arteries and the right and left vertebral arteries. The area of the brain supplied by the internal carotid is called the anterior circulation and that supplied by the vertebral/basilar artery the Posterior circulation. It is from this that we get the Oxford stroke classifications e.g. TACS vs POCS as these vessels are associated with specific clinical syndromes. This is important as these vessels may be the source of or the route of emboli to the brain. The vessels themselves may block and cause stroke. 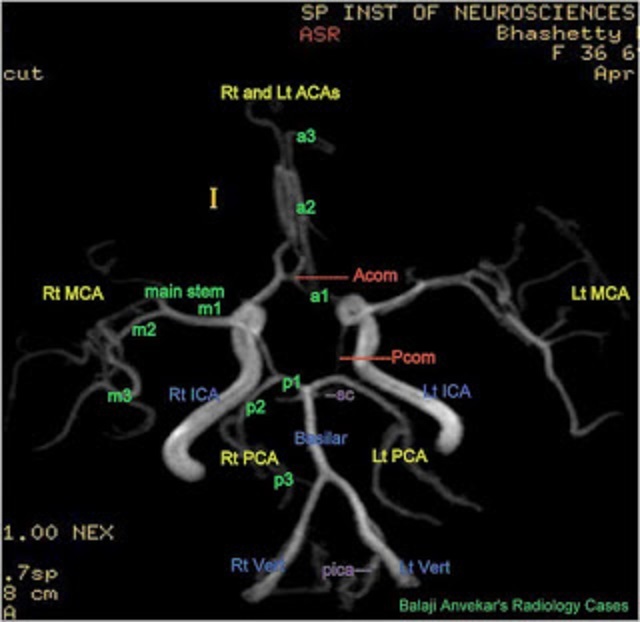 These vessels are the route by which interventional neuroradiologists get access to the large vessels and to the circle of Willis. It is important to quickly get used to the appearance of angiography and the normal anatomy of both carotids and vertebral arteries which are quite distinctive. The easiest thing to spot is the fusion of the vertebrals into the basilar artery and the very tortuous sigmoidal bends of the carotid artery. Once you can identify each major vessel then it becomes much easier. 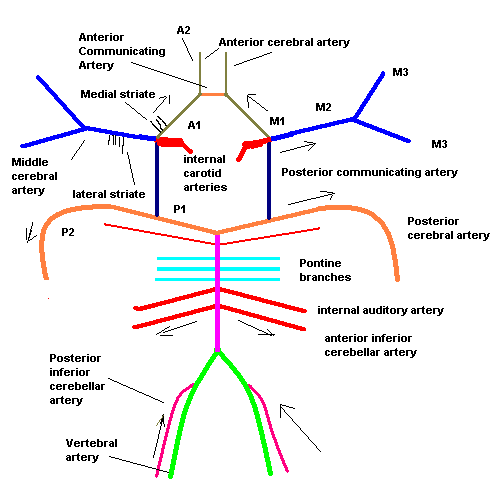 Almost all arteries are paired with right and left branches except for the basilar artery and the anterior communicating and the artery of percheron. Its a typical rule of thumb that for any other than some rare exceptions the end blood vessels supplying the brain respect and do not cross the midline. Cervical segment - within the neck. Associated with sympathetic supply. First branch of the ICA and enters the orbit with the optic nerve and gives off a branch the central artery to retina. The artery runs forward to supply the eye and scalp around the eye as well as frontal and ethmoidal sinuses. Posterior ciliary artery is the main source of blood supply to the optic nerve head (ONH), and it also supplies the choroid up to the equator, the retinal pigment epithelium. The blood supply in the ONH is segmental, so that most of its ischemic lesions result in sectoral visual field defects. Vessel involved in Anterior Ischaemic optic neuropathy and Giant cell arteritis. This artery joins the Internal carotid to the Posterior cerebral artery and so joins anterior and posterior circulations. It is closely associated with the IIIrd nerve which can be compressed by an aneurysm of the PCOMM. It irrigates the ventral thalamus, hypothalamus and tail of caudate. In a minority it can be a large "fetal vessel" and in theory can then bring carotid blood into the posterior circulation. In other variants it canbe hypoplastic. This is formed by the bifurcation of the ICA into MCA and ACA. It passes laterally. M1 segment from the bifurcation of the internal carotid passes laterally to the surface of the insula where it bifurcates. Occlusion here may result in massive infarction depending on collateral supply and whether it is proximal or distal to lenticulostriate vessels. 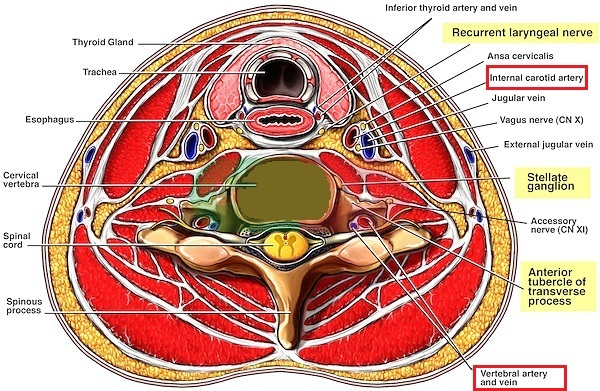 Appreciate the path of the artery and the turns it makes before entering the skull The V3 region is the most mobile section and most vulnerable to injury and dissection is possibly commoner here but can happen anywhere along the artery. Vertebral artery - 1st branches of the subclavian arteries on either side then enter the transverse process at (C6) and ascends through the foramina in the transverse processes of the upper six cervical vertebrae to C1 where they enter the foramen magnum in front of the medulla. Inside the the skull, the two vertebral arteries join to form the basilar artery. Loops around medulla to the inferior surface of cerebellum. 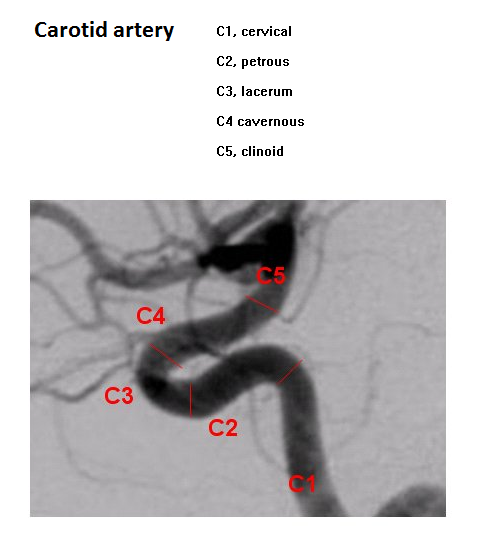 Posterior cerebral artery (PCA)(embryologically originate from Internal carotid) passes laterally and is joined by the posterior communicating and then sweeps back around the cerebral peduncle to reach the tentorial surface of the occipital lobe. Postero-medial ganglionic branches arise at the commencement of the posterior cerebral artery and with branches from the post comm artery pierce the posterior perforated substance, and supply the medial surfaces of the thalami and the walls of the third ventricle. Parietooccipital to the cuneus and the precuneus. 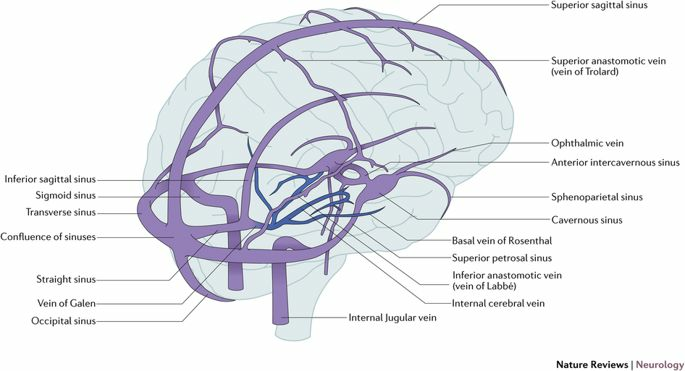 At the base of the brain lies the COW which is an arterial ring connection beween the posterior communicating vessels which bring the anterior and posterior circulation together and the anterior comunicating circulation which brings togetehr both sides of the anteiror circulation. Some call it a heptagon rather than a circle as it does have seven sides. In about 60% of case the COW is deficient with one or more of the arteries being hypoplastic or even missing. 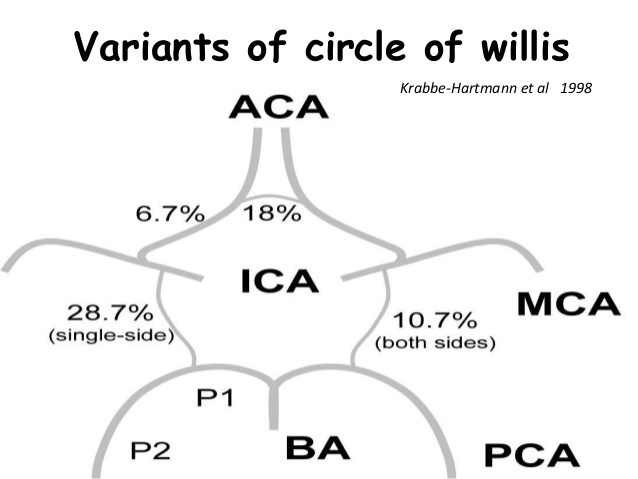 The commonest might be that the A1 segment of ACA is hypoplastic or even absent in 10%, Acom amy be absent in 5% and there may sometimes be an overdevelopped large posterior communicating artery often called a fetal variant which can bring blood from the carotid to the basilar and PCA. This may be seen in 20%. In about a third however the PComm may be small or even absent. 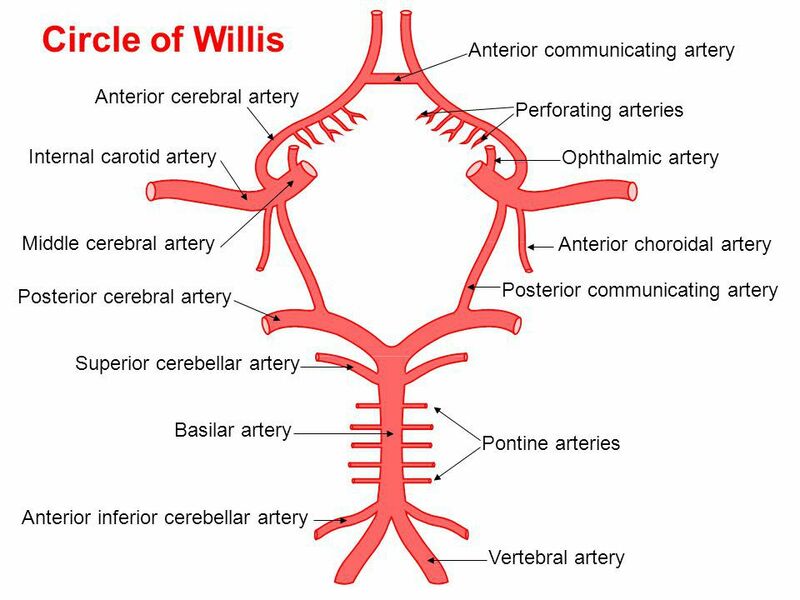 Asymmetry and anomalies of the circle of Willis results in significant asymmetry of flow and is an important factor in the development of intracranial aneurysms and atypical ischaemic stroke. Blood in the COW will flow from high to low pressure. There are many variations on the basic layout. 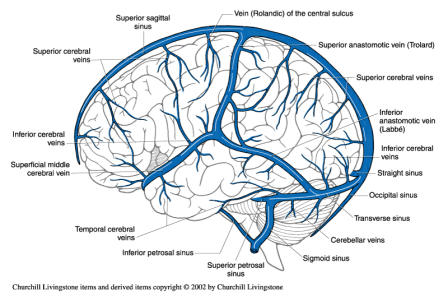 Superior sagittal sinus: Venous blood from the brain passes across the subdural space in the bridging veins and emissary veins into the superior sagittal sinus. The sinus also receives CSF through the arachnoid villi.